Sign Up to Receive e-News and Events! In July 2016, a new Oncology Infusion Center opened at St. Luke's Wood River thanks to community generosity. Community generosity funded the much-needed St. Luke's Mental Health Clinic and a network of mental health professionals to serve our community. Community philanthropy ensures that our ER is staffed with board-certified physicians 24 hours a day, 365 days a year. Celebrate your caregiver with a gift in their honor. Dale E. Bredesen, M.D. is the author of New York Times Bestseller, The End of Alzheimer’s. Dr. Bredesen received his undergraduate degree from Caltech and his medical degree from Duke. He served as Resident and Chief Resident in Neurology at UCSF. He was a UCLA faculty member, then recruited by the Burnham Institute to direct the Program on Aging, and later became the Founding President and CEO of the Buck Institute for Research on Aging. In, 2013 he returned to UCLA as the Director of the Easton Center for Alzheimer’s Disease Research. Through the Bredesen Laboratory, Dr. Bredesen studies basic mechanisms underlying the neurodegenerative process, and translates this knowledge into effective therapeutics for Alzheimer’s disease and other neurodegenerative conditions. His group has developed a new approach to the treatment of Alzheimer’s disease. Through the Bredesen Laboratory, Dr. Bredesen studies basic mechanisms underlying the neurodegenerative process, and translates this knowledge into effective therapeutics for Alzheimer’s disease and other neurodegenerative conditions. His group has developed a new approach to the treatment of Alzheimer’s disease. For the health of our community, it’s important to recognize that depression, anxiety and other mental health conditions are treatable and can improve with professional support and guidance. Help for any mental health issue should be encouraged, and many resources are available in and around our community. Fortunately, there are multiple resources available within our community to help us deal with stress and mental health conditions. The Center for Community Health, with support from the St. Luke’s Wood River Foundation, has recently published Get Help! 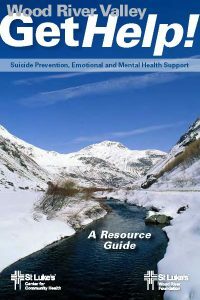 a mental health resource guide for the Wood River Valley, which is available in English and Spanish.